Over the last eight years, Solid Green Consulting has worked diligently to create better living environments, and this year celebrates the achievement of 57 successful green building ratings, covering 750 000m² of built area. Two “first” Green Star certifications in the last year include the Mon Trésor Business Gateway, the first Green Star certified project in Mauritius; and 78 Corlett Drive, which received a six-star Green Star SA Office Design Rating as well as a net-zero carbon pilot rating from the Green Building Council South Africa (GBCSA). Leading by example, Solid Green’s own office in Rosebank, Johannesburg, was the first project in Africa to make it onto the International Living Future Institute’s Biophilic Design Initiative’s Biophilic Map. Moving beyond buildings into the public realm, Solid Green is currently consulting on four of the first 13 projects that are piloting the GBCSA’s new Green Star Sustainable Precincts tool, including Sandton Gate and Oxford Parks. The company was also the EDGE auditor on the first affordable housing project in South Africa to achieve an EDGE certification from the GBCSA. Actively involved in policy development throughout Africa, Solid Green acted as technical consultant when Nigeria’s first Building Energy Efficiency Code (BEEC) was launched in Abuja. As South Africa’s first ambassador for the Living Building Challenge, Solid Green’s founding director, Marloes Reinink, is currently working with US-based architectural firm, A-I-R Inc, on two residential projects in Cape Town that are registered to be full living buildings under the challenge. Training and mentorship also form part of the Solid Green mandate. Three staff members serve on the GBCSA faculty, providing training to enhance the understanding of Green Star tools and certifications. A contingent of five also serves on the GBCSA assessment panel, while two more serve on the GBCSA Assessment Committee, whose responsibility it is to ensure that the certification assessments and processes remain of the highest quality. Lombe is further mentoring a start-up organisation, Khora Group, which was accepted into the Innovation Hub’s Climate and Innovation Centre (CIC). What’s more, Solid Green is a partner in the newly-launched GreenED, an online resource offering online and contextual learning on sustainable design in the built environment and green rating certifications. “Our vision for the future is to maintain our current services in the South African industry and grow our activities and impact into Africa, where real change is needed in terms of how buildings are delivered in order to keep up with the current pace of development on the continent,” says Reinink. 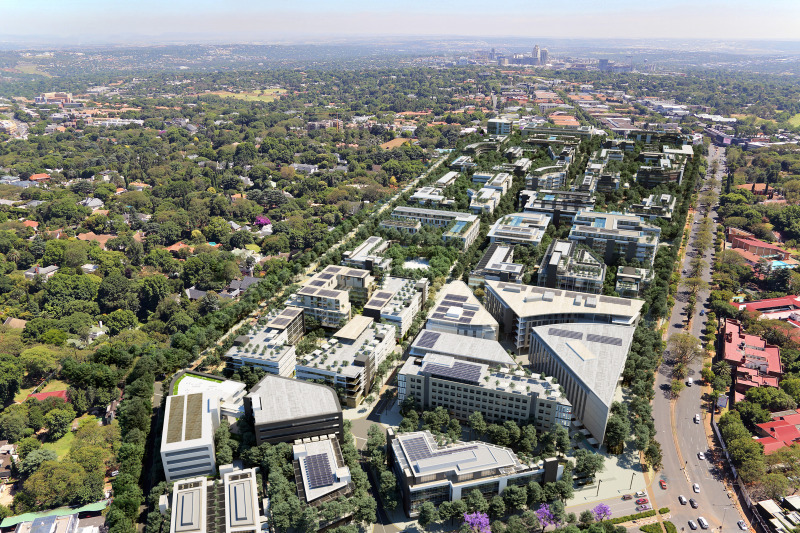 Caption main image: Sandton Gate and Oxford Parks are two of the first 13 projects that are piloting the GBCSA’s new Green Star Sustainable Precincts tool. Or join other discussions on http://www.facebook.com/buildinganddecor, http://www.twitter.com/buildingdecor and https://www.linkedin.com/showcase/10172797/.